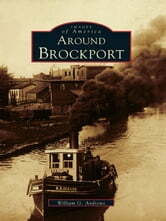 The first settlers came to the Brockport area soon after 1800. Located some twenty miles west of Rochester, the towns of Sweden and Clarkson, the village of Brockport, and a college were organized between 1814 and 1835. The Erie Canal, farm implement manufacturing, and higher education fostered their growth and prosperity in the mid-1800s. At Brockport, the United States became a continental nation, the Industrial Revolution came to agriculture, and popular literature came to American women. Today, Brockport is a remarkably well-preserved Victorian village on a revitalized Erie Canal, Clarkson and Sweden are havens for farming and commuting, and the college is an 8,500-student unit of the State University of New York. Around Brockport presents more than two hundred thirty images from private and public collections, many from glass negatives. They depict such aspects of the area's history as farm life in early Sweden, stately homes at Clarkson Corners, industrial plants in Brockport, and student activities at the normal school.